Microsoft’s recent announcement regarding the .NET Framework is quite an interesting one, especially for those who are interested in the open source community. The idea of making the CLR cross platform across Linux and Mac (on top of Windows of course) will make it easier for developers and users alike and remove the need for projects such as WINE. Within the announcement there was a new version of Visual Studio 2013 called “Community”, aimed at those who are not producing enterprise grade software. Looking at the feature set, it’s comparable to the “Express” versions of earlier releases. 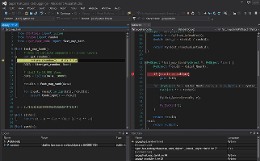 Additionally preview editions of Visual Studio 2015 was released. The new feature of being able to develop for Windows, Android and IOS from one development environment looks quite interesting. Hope these articles have been some help and saved you hours of time. If they have helped, a little donation would be much appreciated.